BlockLauncher v1.17.6 Pro APK – Free direct download new version l. ON JELLY BEAN, THIS APPLICATION CANNOT USE ORIGINAL MINECRAFT TEXTURES WITHOUT ROOT ACCESS! 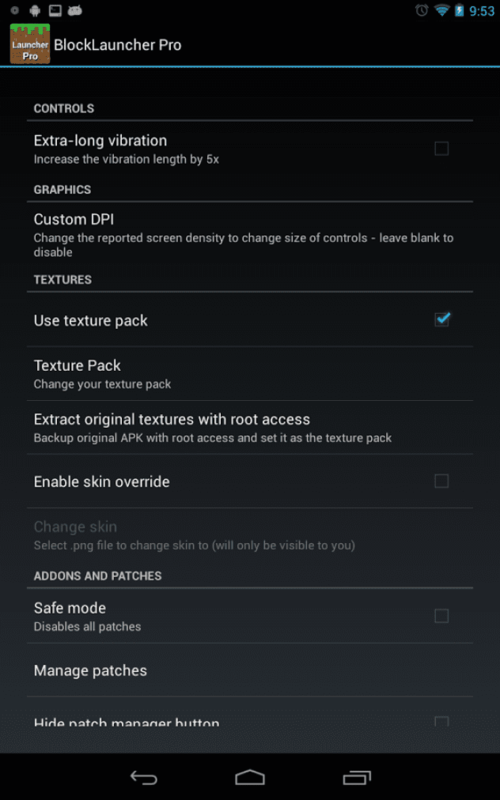 A built-in texture pack is provided for those without root. THIS APPLICATION IS INCOMPATIBLE WITH SOME SAMSUNG DEVICES! Devices with Samsung Knox or other security solutions may not be able to utilize the live patching and the ModPE Script Runtime of BlockLauncher. Patching .mod-formatted patches and texture packs still work. A fix is being worked on.BlockLauncher Pro is a custom Minecraft Pocket Edition launcher that wraps around Minecraft PE and provides loading of patches, texture packs, and server IPs. (formerly known as MCPELauncher)THIS APPLICATION MAY NOT WORK ON ALL DEVICES! Please try the free version before buying this version to make sure that the app is compatible.Just choose Options on the main screen, then select mods. It is that easy!This program loads libminecraftpe.so from the currently installed copy of Minecraft PE, so it should be compatiable with the mod patching features of PocketTool and QuickPatch.Jelly Bean users: currently, this application cannot load original textures from copies of Minecraft installed by Google Play on Android 4.1 and above. The built-in texture pack will be used if no texture pack is selected. Support for Minecraft 1.2.6.2 beta.